To put it bluntly the Chrysler Corporation had a real difficult time connecting with the emerging youth market back in the early to mid-1960s. GM and Ford did a much better job giving youth buyers what they wanted. Ford had won over many youth buyers with the release of the 1964 1/2 Mustang. The Mustang quickly evolved into a performance car. Pontiac a division of GM, had released the 1964 GTO which started the muscle car phenomenon. Other GM divisions like Chevrolet, Oldsmobile, and Buick soon had their youth market performance cars. And where were Chrysler’s Dodge and Plymouth divisions? Selling their boxy plain Jane cars to the buying public. Which was not a bad thing since there were many who wanted good reliable transportation for a reasonable price, and that’s what the Chrysler Corporation provided best. Imperial and the Chrysler nameplates were providing the luxury amenities that well-heeled buyers expected. Dodge and Plymouth however were left to provide transportation for mainstream America. Chrysler across its different marques did provide some sporty and radical styling back in the late-1950s which did garner some youth attention. By the early-1960s Chrysler went to smaller, boxier, and more stodgy styling that really didn’t leave much for the imagination. The Chrysler Corporation had some really hot performance motors in the 1950s and early-1960s however they really had nothing with sporty styling that attracted the youth buyers to put these hot V8s into. The only reason Chrysler had these hot V8s in its arsenal was because at the time Dodge and Plymouth were doing battle with Ford, Chevrolet, and Pontiac on the race tracks, so this fueled engine development. Back in 1964 Jan and Dean sung about the "Little Old Lady From Pasadena" who drove a "Super Stock Dodge" which either was a 1964 Dodge Polara or Dodge 330 equipped with a racing derived max wedge big-block V8. Both the 1964 Polara and 330 were stodgy cars that many senior citizens drove back in the day with a tamer V8 of course. The whole intent of the song was that Granny from Pasadena had one of these rare max wedge equipped Dodges – the ultimate sleeper since most young observers never expected her stodgy car to beat them on the streets. Jan and Dean and the Beach Boys both sung car songs – the records of which were bought in droves by young people who happened to be interested in Corvettes, Thunderbirds, hot rod coupes, Shelby Cobras, etc. (all of which were youth oriented performance cars with the exception of the Thunderbird which was a sporty luxury car). As the song proved, Dodge did pack some real punch but none of the youth listening to this song wanted to be seen in a Polara or 330. Now that for the Chrysler Corporation was a very big problem. Chrysler did see this new emerging youth market coming around the same time Ford saw it. Chrysler had Plymouth release a two-door fastback coupe version of its Valiant called the Barracuda in 1964, a few weeks before the Mustang was released. Unfortunately for Plymouth, the Mustang had much better styling and was the car of choice of the emerging youth buyers – and the rest is as they say history. Chrysler tried again by adding a fastback roofline and some extra styling cues to its mid-sized Dodge Cornett to create the new Dodge Charger in 1966. It was a step in the right direction and Chrysler finally had something sporty enough to put its new big-block 426 CID Hemi V8 and new big-block 440 CID V8 into. By 1967 Plymouth released a sporty upscale mid-size muscle car called the GTX. Finally Plymouth buyers had an attractive car with some serious performance – a standard 440 V8 that produced 375 horsepower and the optional 425 horsepower 426 Hemi. Only there was one big problem its price was out of reach for many young buyers with a base price of $3,178 for the coupe ($3,418 for the convertible). Adding some options to the GTX and it was easy for the price to approach $4,000 which was no small chunk of change back in 1967. As a comparison a base 1967 GTO coupe was $2,871. Plymouth understood this and released a new bare bones mid-sized muscle car for 1968 called the Road Runner. What made the Road Runner so different from the other muscle cars was that its name was derived from the Road Runner character in the cartoon called The Road Runner Show (1966-1973). The Road Runner, a bird, was always outwitting his opponent Wile E. Coyote who was a hungry coyote. Every episode the hungry Wile E. who lived in the desert, came up with elaborate schemes and plots to capture the Road Runner, and turn him into his next meal. However the Road Runner was just too fast. Plymouth paid Warner Bros. a nominal fee to use the trademarked Road Runner name and the Road Runner likeness for this new car. Also included in the deal was permission for Plymouth to use the Road Runner’s familiar high pitched "beep beep" sound made famous in the cartoon, for the car’s horn. Plymouth’s strategy to use a well known cartoon character was brilliant since the Road Runner was a pop culture icon among the youth buyers Plymouth was targeting. Since the cartoon Road Runner which looked like a harmless bird was never caught due to its amazing quickness, it was a name that fit perfectly with Plymouth’s new inexpensive ultra fast mid-size muscle car that looked like the perfect sleeper. The formula equated to runaway sales for Plymouth – a total of 44,599 Road Runners (29,240 coupes and 15,359 hardtop coupes) were sold for the 1968 model year. This happened to be more than twice the 1968 model year total of Plymouth’s GTX which had sales of 18,944 units (17,914 hardtop coupes and 1,028 convertibles). Plymouth which had missed the mark with the youth market with the original Barracuda, finally had struck a big chord with the emerging performance oriented youth segment. In 1968 the performance oriented young buyer now knew he had a home at Plymouth. Part of the Road Runner’s success in its first year was that Plymouth kept the formula simple. There weren’t a lot of different engine options like in the 1968 Dodge Charger which had a laundry list of engines, with the Road Runner a 335 horsepower (425 lb-ft of torque) short deck big-block 4-bbl 383 CID V8 was standard which provided enough punch to do battle with most of the muscle cars on the market at the time. And 335 horsepower in a performance car that had a base price under $3,000 provided one of the best horsepower per dollar ratios a young buyer was going to find in 1968. The 383 which had a 4.25 inch bore and a short 3.38 inch stroke was a member of Chrysler’s (big-block) B engine family – the B engine was a short deck version of Chrysler’s big-block RB engine family. Plymouth was smart making the 383 standard on the Road Runner since it provided the Road Runner’s customers with standard big-block V8 power. Other budget muscle cars of this era came standard with a small-block V8 and a big-block was optional. Plymouth could have also offered the 330 horsepower 383 that was available in its other models and most Road Runner buyers would have been happy. However Plymouth would have no part of that, it wanted to give its Road Runner buyers a special hopped up version of the 383 V8 which took the following performance parts from the powerful (375 horsepower) 440 V8: intake manifold, cylinder heads, exhaust manifolds, valve springs, crankcase windage tray, and camshaft. 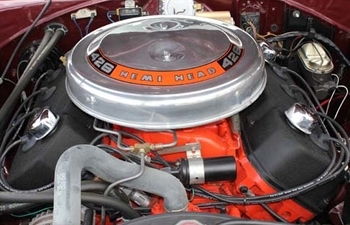 Making this engine even more special was that the Road Runner happened to be the only Plymouth for 1968 to get this high performance version of the 4-bbl 383 which was called the Super Commando 383. The horsepower rating was only 5 horsepower more than the standard 4-bbl 383, but who was Plymouth fooling? One drop of the accelerator pedal to the floor board proved to the naysayers that this high-performance 383 was a lot more powerful than the standard 4-bbl 383. Performance for the 383 equipped 1968 Road Runner was 0-60 in 7.1 seconds and a 1/4 mile time of 15 seconds at 96 mph. Plymouth also had its bases covered for those who wanted more power, it offered the legendary dual 4-bbl 426 (CID) Hemi V8 which Plymouth claimed produced 425 horsepower (a rating which was underrated). Though the Hemi added a hefty $714 to the Road Runner’s low price, it was worth every penny when the back in the day unsuspecting competition who were expecting to race against the Super Commando 383 only to be easily dusted in a stoplight to stoplight race – Plymouth made sure the Hemi badges (located on the hood vents) were so tiny you had to have Superman’s vision in order to see them. The Road Runner when equipped with the 426 Hemi went 0-60 mph in 5.3 seconds and the 1/4 mile in 13.55 seconds at 105 mph. What the Hemi provided the Road Runner buyer with was a racing spec motor in a budget muscle car – a combination that would make the Hemi Road Runner one of the quickest muscle cars of the golden era and would also would make it one of the greatest sleeper performance cars of all time. 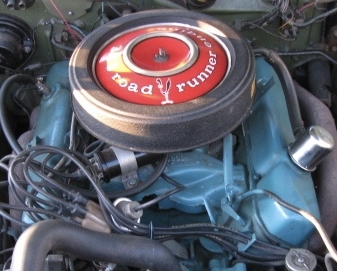 However only 1,011 1968 Road Runners were ordered with the Hemi (about 2 percent of 1968 Road Runners). Another perk of Road Runner ownership was a standard floor mounted heavy duty A833 four-speed manual transmission for both the 383 and 426 Hemi – a Hurst shifter replaced the standard shifter in the middle of the 1968 model year. Chrysler’s three-speed TorqueFlite automatic transmission was optional in the Road Runner for both engines. The Road Runner also came standard with dual exhausts, Chrysler’s heavy-duty (3.23 geared) 8 3/4 inch rear axle, a heavy-duty suspension, and large 11 inch drum brakes which were bigger than most of the competition’s brakes of the day. Chrysler for 1968 redesigned its mid-sized B-body, the net result was nicely sculpted external styling that was more rounded than the blunt edged styling of the previous year. It was this B-body styling that made the 1968-1970 Charger such a success with muscle car fans. For 1968 both of Plymouth’s muscle cars the Road Runner and GTX were based on the Chrysler B-body. However there was one big difference, the GTX which was Plymouth’s upscale muscle car was based on the more upscale B-body Plymouth Satellite while the Road Runner was based on the Plymouth Belvedere (another Plymouth B-body offering). The Satellite had more chrome trim and had a more upscale exterior and interior. The Belvedere was essentially Plymouth’s bare bones stripper car which was purchased by the frugal buyer along with a favorite in four-door format among taxi cab companies and police departments. Most will remember the 1968 Belvedere as the car used by the two main characters the first season in the popular police drama Adam 12 (1968-1975). 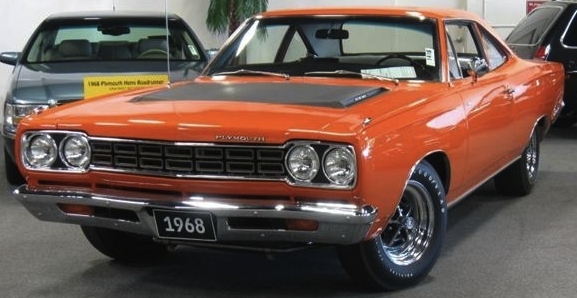 Plymouth did however give the Road Runner a muscle car hood with dual vents (also shared with the GTX) which helped to differentiate it from the Belvedere. The Road Runner used the Belvedere’s front grille but it was blacked out. 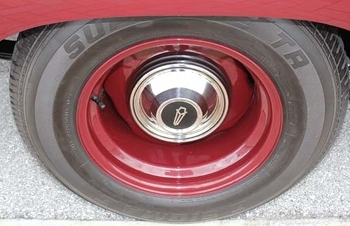 Unfortunately the Road Runner came standard with the Belvedere’s dog dish hub caps on 14 inch wheels however performance oriented F70-14 tires were standard except when the Hemi was ordered then 15 inch wheels were standard with F70-15 tires, dog dish hub caps were also standard on the Hemi. Fortunately both the Hemi and 383 Road Runners could be ordered with attractive five-spoke chrome wheels more befitting of a muscle car, 15 inch for the Hemi and 14 inch for the 383. 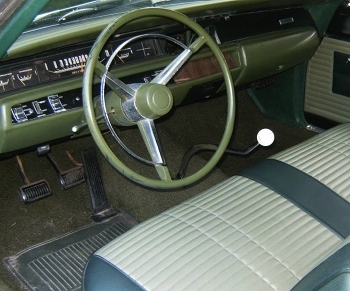 And when it came to the interior the Road Runner came standard with the Belvedere’s bench seat and bare bones dashboard/gauge layout with the horizontal speedo. Only a Road Runner dash plaque gave a clue this wasn’t a Belvedere. Plymouth wasn’t worried about the Road Runner’s spartan nature since it offered for performance buyers standard bucket seats and a flashy center console with the GTX. Truth be known most of the youth buyers didn’t mind the taxi cab interior, they were just happy they had so much performance with the Road Runner for the money. And the good looks of the Road Runner’s Belvedere based exterior also won over many fans. Initially the 1968 Road Runner was only available as a two-door coupe – a pillared coupe. Later in the 1968 production year the two-door (pillarless) hardtop coupe was introduced. Unfortunately a convertible model would not be offered on the Road Runner until 1969. 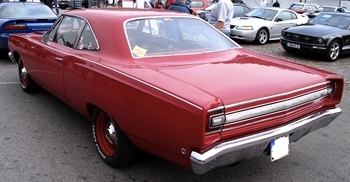 Also offered later in the 1968 production year was the $79.20 Road Runner Decor Group option added to the car extra trim pieces – one of which gave the rear a much more finished overall look with a decorative chrome panel with red stripes that connected the two taillights together giving the rear an appearance of a one big taillight fascia. With the Decor Group option, between the two taillights "P L Y M O U T H" was spelled out to finish off the look. Plymouth may have arrived to the muscle car party late compared to most of its competitors, however the Road Runner’s introduction in 1968 was a big game changer. The 1968 Road Runner offered the most bang for the buck for the budget conscious buyer, it also ensured Plymouth a big place at the table in the annuals of muscle car history. If the Beach Boys had still been singing car songs instead of the drug-induced songs from their Wild Honey album when the 1968 Road Runner was released they would have certainly have sung a song about the Road Runner. In 1968 the youth counterculture movement was hitting its zenith and one of its favorite slogans was "power to the people". Back in 1968, Plymouth took this saying to heart and with the Road Runner it gave a heck of a lot of power to the people for the money and the young performance car buyers at the time couldn’t have been happier.